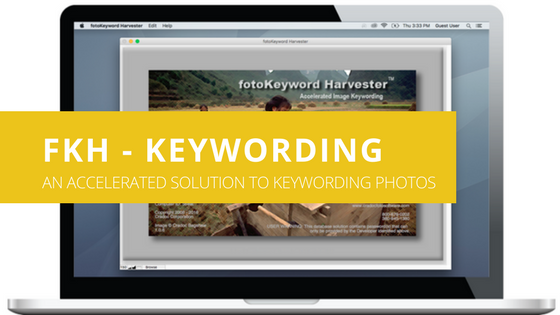 The fotoKeyword Harvester™ gives you an accelerated solution to keywording photos and improves the quality of your image keywords. You don’t need to repeat unnecessary tasks over and over again. When you use the fotoKeyword Harvester to keyword images, you’ll get help learning the language of keywording. How many languages do you know? Probably more than you realize. Obviously you know English, you’re reading this. Maybe French, Spanish, Italian? Learning one or more of these languages has had one overriding common factor. You wanted something, and you had to learn the word or words to get it: food, water, bathroom, hotel, ticket. If you only know your native language it’s probably because you don’t need another language to get what you want. But there’s another language that most of you do know; Google. Think about it. When you started searching Google you’d type in a word, and if you were lucky you got the results you wanted. Most likely though you just got junk. So you started selecting your search words more carefully, putting in phrases or groups of words to try to get more useful results. If you’re like me you’re pretty good at putting together the words you need in Google to get the results you want. You speak the language. Guess what language most photographers don’t know… Keywording. You haven’t learned the language of photo keywording because you don’t search for images. You don’t constantly refine the words you use through a process of trial and error to get the photos you want. The people who have learned to speak Keywording are the photo buyers. They’re the ones who use keywords to find images and they need to get good results quickly. Your stock agencies probably don’t speak Keywording either, but they have access to the results of the buyer’s searches, and if they are wise enough to use those results, they make sure that the images that satisfy the buyers most are the first ones that they’ll find during their searches. First you go through the same process that the photo buyer goes through to find images. You’ll look for images similar to the image you want to keyword in several different sources, and then see what words are used to describe that image. When you find words that you think will be useful, you’ll capture them and paste them into the Harvester’s keyword window. You can grab bits of other keywords, sections of descriptions from a dictionary, text from an encyclopedia, etc. Drop in the bits and phrases that have the words you want. They can be in any format, from other keywords to blocks of text. When you click the Harvest button your research is formatted into a clean block of keywords all separated by a comma or semicolon, with duplicate words automatically removed. You don’t need to be too careful when you grab or harvest, your words. In step two, you double-click the words you don’t want and delete them in the Harvester. It’s much easier to recognize words that don’t describe your image than it is to think of all the words that you need while you look at a blank window every time you have a new image to keyword. The next step is to fine-tune your keywords using the Keyword Composer, a controlled vocabulary feature built into the fotoKeyword Harvester that lets you select keywords from a list of thousands of words in different categories. But by the time you get here, the place where most other keywording programs start, most of the work has already been done, so now you can quickly scan for words that you didn’t find on the Internet and add them to your block of keywords. Once you have completed your online photo keywording research, have found all the words you can to describe your image’s keywords on the Internet, and have fine-tuned those keywords in the Keyword Composer, you have your final block of keywords. The fotoKeyword Harvester works side-by-side with any image editing or cataloging programs such as Lightroom, Aperture or PhotoShop Bridge. You now copy the final keyword block from the fotoKeyword Harvester and paste it into the metadata tag or keywording section for the image you have selected to keyword in your image editor program. You can even use the fotoKeyword Harvester to create keywords working directly on your agency’s website. It doesn’t matter what program you use since the Harvester works independently from it. To save time in the future, once you’ve built a keyword block that might be useful as a starting place for similar images, you can save the keyword block as a template that is easily recalled whenever you need it.